-If you are the first person in the thread to post about the episode after subs have come out, please put a big SPOILER WARNING in your post, which will act as a warning for the rest of the thread. Judging by the end of last week's episode, we'll see some Urumi focus this time. Can't wait! I'm soooo stoked for ep 8!!!! I like Honda Tsubasa as Urumi. She's good and cute! Yeah, the ending makes me go arggg. I really wanna watch the next one! I really hope Urumi is ok T T.
Great episode, really like Urumi's story and her replacement to help Onizuka pass the exam instead of Fuyutsuki. I must admit, the fighting scenes in this version surpasses the 1998 one by far (was there even any fighting in that one? ), which showcases Onizuka as a beast who is capable of taking down whole gangs on his own. I think Urumi and Onizuka have great chemistry together and the actress who played Urumi portrayed her quite well. The way that Onizuka's blood was portrayed was too fake, could've been better. And the fist bumping thing is starting to get a tad annoying lol. Looks like Miyabi's and Urumi's clash next week, with some of Miyabi's background as well. Can't wait! So the Subs are Out? And here are my thoughts! BEST EPISODE OF THE 2012 GTO DRAMA SO FAR! 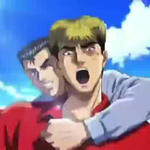 The damn fist bump just look ridicilous and that had to be the moment Onizuka passed out? The dried blood on the paper was too red. When blood dries on paper it goes brown-ish and not completely red. Really those are complaints I have. I'm going to climb this mountain and nothing can stop me. Yeah and Looks like another Good Epsiode. This Series is starting to get Good it looks like. Though it seems to be Part 2 of this Epsiode. I loved the episode. Need to see it in a higher res, but my notes from watching it live. I liked how Teshigawara used Onizuka's background as a gang member as his way of revenge. The scene between Fuyutsuki and Sakurai was cute. More interaction between Anko and Yoshikawa. They mention the friendship between Miyabi, Tomoko, and Urumi. At least they got rid of the whole fish eye/fish head being good for your brain...would be nice if Onizuka had to eat one. Since GTO is set in Kichijoji...I love how they went to Odaiba in the ferris wheel scene (with the FUJI TV station (who carries it in Kanto)) in the background. I just wonder how they got there so fast..
What's the deal with the students messing with the wrong people? Next episode, Onizuka finds out about the death of the student which led to the whole class 2-4 revolt. And Kanzaki's mom only cares about the stock market....as ususal. Must...watch it at 3am again next week!!!! I will make it a note to go to Kichijoji station the next time I go to Japan, since I do shop in Nakano. That is Different too the 1998 Version where the Student just Left? Did the Teacher Kill the Student? According to the preview on the ktv site...looks like the student jumped off because of their previous homeroom teacher. And Kanzaki jumped. So that is why she was in the Hospital? I thought she was Hurt Phyisically. I think Miyabi was also in love with the Ex-Student. Why did Kanzaki Jump then? The student who jumped looked female. In the manga, when her secret was revealed...she made Miyabi suffer with the website, she felt Onizuka betrayed her also, and she decided to kill herself knowing that she will receive no punishment for her terrorism. Wonder if something similat will happen in ep8?? Kanzaki is cute, lovely, perfect. I fall in love with Honda Tsubasa already. Powered by phpBB3, Designed by Adonis K.